Home Our Gate Services Gate Opener Are Electric Gate Openers Safe? The sheer size of some automatic gates may intimidate some people, and for good reason too. This large mechanical system can crush you if you're not careful and if it isn't equipped with special safety features designed to prevent these sorts of accidents. Luckily for us all, though, modern electric gate opener models come with features that help them ensure user safety, but it's still up to the owners to maintain and test them regularly to ensure they stay in safe and functional shape. 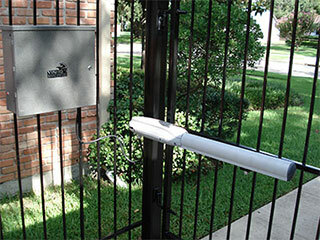 According to the regulations by the U.S. Consumer Product Safety Commission, automatic gate owners are obligated to ensure their systems have the required sensors and that their opener meets the latest safety standards. Your new automatic gate opener may boast the latest safety trends, but you still need to check it every so often to ensure those are still functioning. As time goes on, various parts can wear out and influence other parts that may not be directly connected. Sensors can get out of alignment, and even electrical circuitry can become damaged after a while. If you follow some basic regulations and rules, you don't have to be afraid of accidents and injuries and can enjoy the added convenience and security. When was the last time you checked to make sure your gate's safety sensors are working correctly? If it's been over a month, not to mention a year, you'll definitely want to test them out, just to be safe. Remember that these sensors must be installed on both sides of the gate and their lenses need to be clean and unscratched. Open and close the gate and wave something in front of them to see if it reverses in response. There tends to be a knock on effect with large mechanical systems like your gate. That's why it's important to make sure that the entire system is properly taken care of, and not just some parts. When you do your annual maintenance, make sure to be extremely thorough with both the parts and the material. Remember that your steel or wooden gate will break down sooner rather than later if you start neglecting certain areas. Keeping the gate and its surrounding as clean as possible is very important, as dust and dirt can cause safety sensors to fail to detect properly, and that's definitely something you'll want to avoid. If while performing some maintenance, or at any other time, you discover a problem with your driveway gate, rest assured that our experts will be able to provide the professional repair solutions you'll need. Don't hesitate to call Gate Repair Glendale whenever something goes wrong.